Good rendered for evil; blessings for curses; pardon, peace, concord, and reconciliation. A Collect for the Memorial of Saint John Gualbert speaks the language of the Gospel, ageless and ever new. 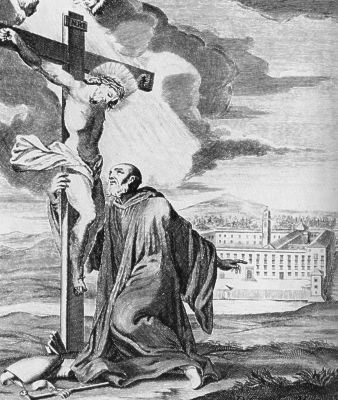 Almighty and ever-living God, source of peace and lover of concord, to know Thee is to live, to serve Thee is to reign; establish us in Thy love, that by the example of the blessed abbot John Gualbert, we may render good for evil and blessings for curses, and so obtain from Thee both pardon and peace. 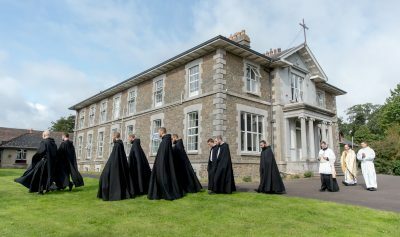 John Gualbert’s monastic vocation unfolded in dramatic circumstances. A medieval Florentine nobleman, he lived in an age and culture that, in spite of the Gospel, exalted vengeance as a matter of honour. When his elder brother was murdered, John felt compelled to avenge him. On a certain Good Friday, riding through a narrow mountain pass, just below the basilica of San Miniato al Monte in Florence, John came face to face with his brother’s killer. The man was alone. The place was isolated. There was no escape. John drew his sword, ready to exact a bloody vengeance. The murderer raised his arms in the form of a cross and, in the Name of Jesus Crucified, begged John’s forgiveness. Cut to the heart by the grace of the Cross, John dropped his sword, embraced his enemy, and made his way straight to a church in Florence. There, kneeling before the crucifix, John saw Jesus Crucified bow His head, acknowledging his act of forgiveness and, by the same token, forgiving him all his sins. And so, John became a monk of San Miniato al Monte. 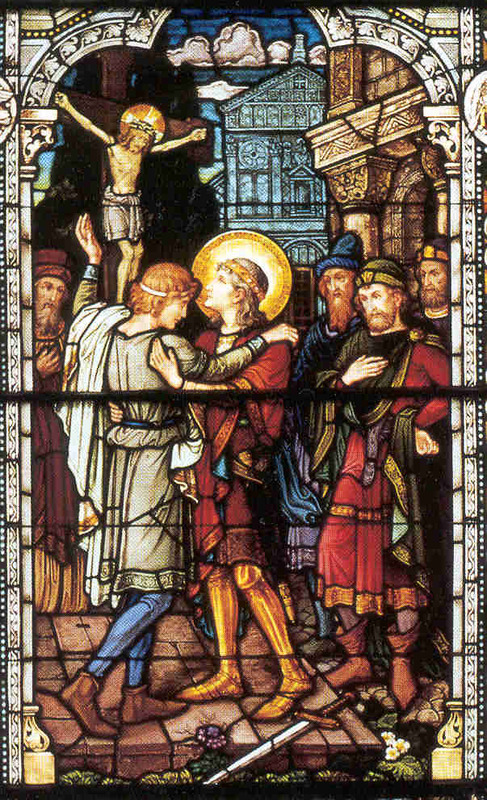 A splendid stained-glass window telescopes the story into one scene. John is shown as a young nobleman. With his eyes fixed on the image of the Crucified, he is embracing his enemy, the murderer of his brother. The iconography of Saint John Gualbert makes for a fascinating study. In nearly every image the saint is represented looking at Jesus Crucified, embracing Him, or holding the Cross against his heart. After a few years in Florence, John entered into conflict with the abbot of San Miniato, whom he accused of simony and of a falling away from monastic observance. John Gualbert was obliged to leave San Miniato. A sympathetic Lady Abbess gave him land at Vallombrosa — the name means “Shady Valley” — where he established a new monastery. John never became a priest. The Benedictine observance of Vallombrosa was characterized by simplicity, poverty, and the care of the sick in the monastery hospice. In some ways, Saint John Gualbert prefigured Saint Francis of Assisi. What speaks to us in all of this, I think, is that John Gualbert’s monastic vocation began on Good Friday in a decisive encounter with Jesus Crucified. Saint John Gualbert points to the Cross as the source of all forgiveness and reconciliation, giving peace to those who dwell in the shadow of its branches. “They shall return,” says Hosea, “and dwell beneath my shadow, they shall flourish as a garden” (Hos 14:7). The reformed Benedictine lectionary offers proper readings today: Leviticus 19:1-2, 17-18; and Matthew 5:43-48. The lesson taken from Leviticus, speaks powerfully: “You shall not hate your brother in your heart, but you shall reason with your neighbour, lest you bear sin because of him. You shall not take vengeance or bear any grudge against the sons of your own people, but you shall love your neighbour as yourself: I am the Lord” (Lev 19:17-18). The Benedictus Antiphon proposed for today is another stroke of liturgical genius: “Save us, Lord, from our enemies, and from the hands of all who hate us, to guide our feet into the way of peace” (Lk 1:71, 79). The Word of God compels us always to seek the Face of the crucified, risen, and ascended Christ. One cannot look at the Face of Christ and harbour resentment in one’s heart. One cannot look at the Face of Christ and refuse to look at one’s brother. One cannot look at the Face of Christ with compassion and then refuse a look of mercy to one who waits for it. Ask Saint John Gualbert today to obtain for us the grace to seek always the Face of Jesus Crucified: His Eucharistic Face, His Face hidden in the Scriptures, His Face depicted in holy images — yes — but also His Face in one another. One who refuses to meet the gaze of Our Lord will never come to know the secrets of His Sacred Heart. Quaerite faciem Domini semper. “Seek always the face of the Lord” (Ps 104:4b).